This section contains information related to SkyEurope, flight code NE, a low-cost carrier original type. "SkyEurope is the leading and largest Central European low-cost airline. With five bases in Czech Republic, Hungary, Poland and Slovakia, it is also the first multi-based airline in the region of Central Europe. SkyEurope operates from its bases in Budapest, Krakow, Warsaw, Prague and Bratislava. As a low-cost air-carrier from a low-cost country, SkyEurope is well-equipped for competition in the European market. 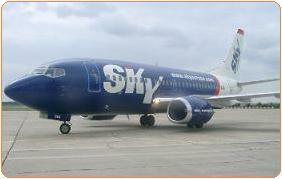 SkyEurope placed in 2005 an order for up to 32 new Boeing 737-700 aircraft (of which 16 are subject to purchase rights) to be delivered between March 2006 and 2009, currently the largest order in Central Europe valued at US$1.76 million at list prices. The 12 first aircraft will be financed and leased to SkyEurope by GECAS. This aircraft order will reinforce and enlarge the Company’s aircraft fleet during the period 2006 - 2009. The airline started operations on 13 February 2002. " Note: only SkyEurope flight numbers NE have been used. SkyEurope Holding AG has been listed on the stockmarket. Click to browse to the network development section of this site, featuring more more information on the network development of SkyEurope.